A live iguana has been found dumped in a box on a beach in Kent. The two-foot animal was discovered by a walker on Sheerness beach. It was taken to Flowers Vets in the High Street where it was found to be suffering from broken spines and was shedding skin. Now the RSPCA is trying to find the person who dumped it. Ray Bailey, RSPCA chief inspector, said: "This iguana was clearly dumped on the beach by someone who could no longer care for it, but to abandon any animal like this is breaking the law." 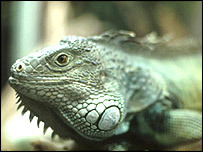 Many people buy iguanas from pet shops and dealers without knowing how to care for them properly, Mr Bailey said. He added: "Exotic animals, particularly iguanas, are extremely difficult to care for. "Iguanas are often bought when they are only a few inches long but can grow to five feet long and need an area as big as a small room to keep them in, as well as heaters to keep then at the right temperature." Anyone with information about who may have dumped the animal should contact the RSPCA.